This work was formerly attributed to the so-called Master WB, an artist studied by Buchner. It was not until 1985 that Fedja Anzelewsky associated it with an engraving bearing the initials WB and an entwined serpent, identifying the artist as Wolfgang Beurer. A fantastical figure depicted on the back of the panel bears a coat of arms that made it possible to identify Von Rückingen. The panel, dated 24 April 1487, was attributed to the Master WB. This anonymous artist, known by the initials of his first name and surname, was studied by Buchner, who attributed paintings, engravings and designs to him. The following step towards identifying the painter was taken by Fedja Anzelewsky, who linked the initials WB to Wolfgang Beurer. 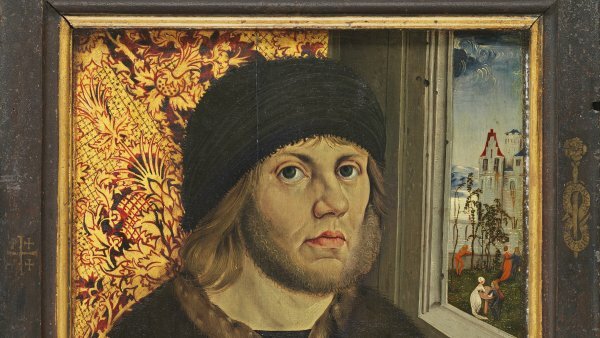 The connection was made through a drawing in Gdansk, which belonged to Dürer’s collection and displays the name of the artist and the date of execution of the design on the reverse, written in the Nuremberg artist’s own hand. 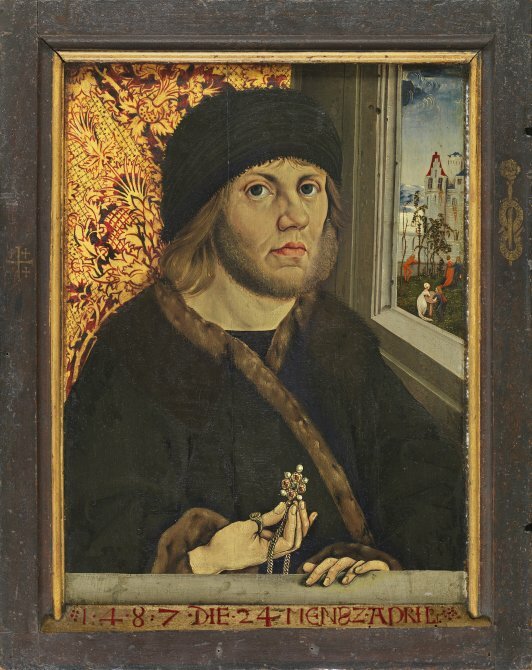 Beurer locates his sitter in an interior adorned with a rich tapestry that acts as a backdrop on the left; on the right is a window whose frame is arranged in a pronounced diagonal. The ledge just in front of the sitter, on which he rests one of his hands, heightens the sense of depth of the room and the composition. 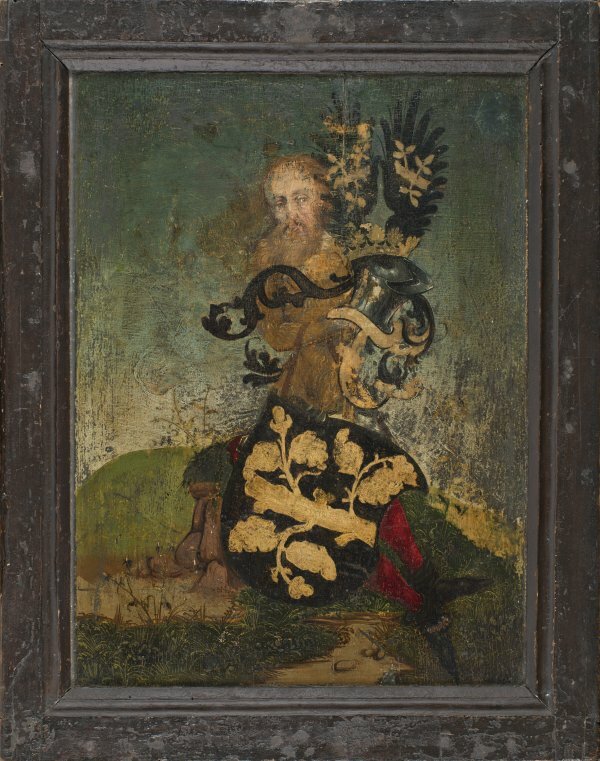 The sitter’s identity is known through the coat of arms depicted on the back of the painting. It belongs to the Frankfurt patrician Frankfurt Johann von Rückingen, who displays a ring with a coat of arms and the letter “R”. The figure is constructed using a limited palette and the artist skilfully combines the dark tones of the coat and turban with the ochres used for the fur trimmings and the beard and hair. The fact that he holds a fine pendant on a chain and the choice of an outdoor setting suggest that this is a betrothal portrait. Indeed, the two grooves on the frame of this panel indicate that it may have been joined to another panel depicting a female sitter. Beurer defines the sitter’s face with pronounced, precise strokes, which have been related to those of two engraved portraits. The parallels are evident in the expressiveness of all three heads, the way of drawing the large eyes that gaze at the viewer, and the setting. The symbols in the centre of the bars of the frame are related to the trip Von Rückingen made to the Holy Land, as the emblem of the Knights of the Holy Sepulchre appears on the left and that of the Cypriot Order of the Sword on the right.